CloudOn, the free productivity app that gives users access to Microsoft Office on their mobile devices, just introduced a new version that works on a number of new devices and integrates more third party tools. Until now, CloudOn has mainly been used on tablet devices, but version 3.0 of the mobile app is also available on iPhones, iPad Mini, and Nexus 7 devices. In addition, the new app offers support for Microsoft SkyDrive, along with existing support for other applications and tools like Dropbox, Box, and Google Drive. Of course, the main draw of CloudOn is that it gives users access to the Microsoft Office suite while on the go, so that editing documents, spreadsheets, and presentations doesn’t have to take place within the confines of an actual office. 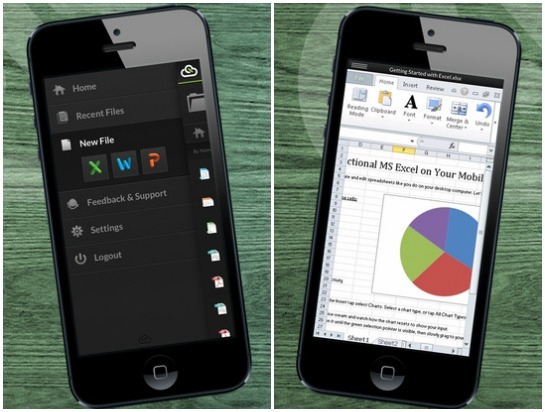 The photo above shows the main dashboard on the iPhone app, as well as an example of editing an Excel spreadsheet in the app, which includes all the same Excel features you’re used to seeing on more traditional devices. Cloud technology has made collaboration between team members infinitely easier. But the introduction of mobile technology into workplace culture has complicated things a bit, since not all of the same tools and applications are available on mobile devices as they are on traditional workplace computers. So instead of just hosting files in the cloud, CloudOn stores applications there so that they can be used on a variety of different devices. But rather than introducing you to a new cloud storage solution or brand new applications, CloudOn specializes in giving you access to the applications you and your team already use. This new version simply makes it easier for even more users to take advantage of the productivity app, meaning they can access tools and files from their mobile devices without having to actually upload the files to a new storage service or applications. The app was originally introduced in January, when it was made available for just iPad users. To date, it has been downloaded onto more than 3 million devices. It is currently available for free in both the App Store and Google Play. The post CloudOn Productivity App Now Available on More Devices appeared first on Small Business Trends.